If your dog has a barking problem, then one of the solutions that you may want to consider is a dog silencer. Dog silencers are devices that are created to teach your dog not to bark. They are sometimes called anti-barking devices, or very commonly known as anti-bark collars, even though the dog collar form is only one form of the device. In this buying guide, we will be looking at the top five dog silencers on the market as well as the information that you need to make a good buying decision on which dog silencer to buy on your own. There are a lot of things to consider, so a comprehensive buying guide will be able to help you make the best decision possible. These are the top five dog silencers currently on the market. This list is made up of different devices, but all are effective bark deterrents that you should have a great deal of success with. You can choose to find an anti-bark device on your own, but if you want an easy solution and some good recommendations on which bark deterrent to get, then you cannot go wrong with these dog silencers. Now that you’ve seen our top 5 recommendations, we’ll give you more detail on each of them, including why we liked them. When you’re ready, click the button to get the best price on Chewy or Amazon! This Zeler’s outdoor anti-barking device is an outdoor anti-barking device that works on ultrasonic sound principles. The way that this particular device works is that you install it outside and it admits an ultrasonic sound to silent your dog. This anti-barking tool is based on the latest ultrasonic technology and it is much more effective than previous versions. In addition, this device is completely waterproof so you can attach it to a fence post, the outside of your home or anywhere else you like and it will be perfectly fine whenever your dog barks, even after it rains. This is a 100 percent safe and effective barking deterrent tool recommended and trusted by dog trainers and veterinarians around the world. It does not use any liquid propellant, no electric shock or any other methods that some people have taken issue with is being inhumane. In fact, this is one of the most humane anti-barking deterrents on the market. When your dog barks, this tool emits an ultrasonic wave that let your dog know to stop barking. It has extended range, so it not only works for your own dog, but it may even work for the neighbor’s dog. Because this high-frequency sound device works so well, it is appropriate for dogs of any size or breed including Rottweilers, Pointers, German Shepherds, Yorkshire Terriers or Beagles. This is a wonderful training tool in addition to other training tools like a dog crate, puzzle toys for dogs, automatic fetch machines, dog activity monitors or GPS tracker for dogs. There are two LED status indicators for the battery and for different ultrasonic volume levels. This is an easy to use and customizable anti-bark tool that you will love. This is a handheld bark deterrent from Doggie Don’t, and is one of the best dog silencers out there for breeds like Labrador Retrievers, French Bulldogs and Poodles among others. When it comes to handheld bark deterrents, they are extremely useful and easy to use and can be one of the best Christmas presents for dogs or dog owners and just as effective as other behavior modification such as making your dog go to their dog house or outdoor dog kennel or lay down on their dog bed or dog playpen when they bark. This is a dog silencer that uses a specific sound in order to prevent barking. When your dog barks, it can be annoying for you and your neighbors, and this anti-barking device helps to train your dog not to do that. However, this device also does a lot more including fighting against the leash, being too aggressive, nipping, chewing, digging in the ground and even food stealing. This device produces a very loud sound both you and your dog will be able to hear and it gets your dog’s attention immediately just the same way that a well-trained dog would stand to attention when hearing the word ‘no’. This device is very humane and does not spray or shock your dog to correct their behavior. There are lots of accessories that you need to get for your dog or that you could get for your dog including a dog seatbelt and dog car seat cover, dog bike trailers to take your dog on bike rides with you, cooling pads for dogs or cooling vests for dogs to keep them cool in the hot weather and many more. However, getting the best anti-bark devices is definitely on the list. Some of the other terrific features of this audible anti-bark system include an easy to use button for training, and ergonomic design and included batteries and a wrist strap for you to carry the device around with you for training purposes. This ShamBo anti-barking tool is one of the most advanced anti-barking devices currently on the market. This is the latest technology when it comes to barking deterrents, using ultrasonic sound to silent your dog. However, even this relatively new technology has been updated to be the most advanced anti-barking tool that you have ever used. This is a totally waterproof and improved deterrent that you install outdoors to prevent your dog from barking. If your dog spends most of his or her time inside, you may want to consider installing it indoors instead. Of course, you can always get two devices and put them both places so that you will always have a deterrent to prevent your dog from incessant barking. How this anti-barking device works is with a very sensitive microphone that picks up dog barking from up to 50 feet away. When it detects barking, it admits a signal that makes your dog want to stop. You can use the first level for indoors, and then raise up the levels for outdoors if you need to. 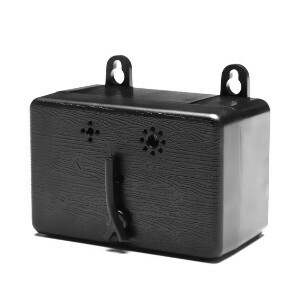 This bark controller is extremely small and can be mounted anywhere in your yard with predrilled holes in the back that make it easy to hang it on a fence post, a tree trunk or on the side of your house. It is 100 percent safe and humane for dogs and humans, causing no injury to your dog’s ears or any pain. 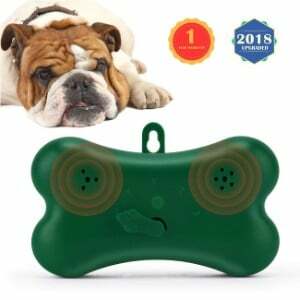 This part controller also comes with a 100 percent satisfaction guarantee lifetime warranty which is something that you simply do not see with almost any other product on the market – bark deterrent products or anything else. This is a small, attractive anti-bark tool that uses the latest technology to prevent your dog from barking out in the yard or inside the house has several advanced features such as customization options that allow you to set the levels. 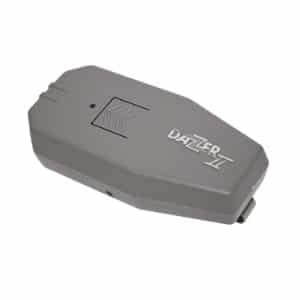 The Dog Dazer II is an ultrasonic dog deterrent that you hold in your hand and use it with the press of a button. To be honest, this is not that impressive of an anti-bark device when it comes to features. However, this is probably the best budget option that you have ever come across. The price is so low that you will be pretty amazed. Plus, it actually works. It is extremely effective at getting your dog to stop barking. All you have to do is go outside when your dog is barking and press the button in your dog will stop. Unfortunately, there is no automatic feature where you can set it up somewhere and have it go off automatically when your dog barks, but for the price what you get is actually pretty amazing. What this is actually intended for is those who not only want to deter dogs from barking, but also for those who want to prevent dogs from approaching them or attacking them, specifically service people like sales people, delivery persons, mail carriers and more. When you press the button on this device, it admits an ultrasonic sound that your dog can hear which sounds just like a car horn blaring right next to you. It will stop any dog in its tracks, prevent them from barking and even preventing stray dogs and cats from approaching you. This is a really simple device that runs off of a nine volt battery, but it comes with additional features like a low battery indicator and a belt clip so that you can carry with you at all times. It works up to 20 feet away, as long as you have line of sight with your target, and it is perfectly harmless to both pets and humans, implementing the latest in ultrasonic technology to emit a warning sound that only pets can hear. When it comes to budget anti-bark devices, this one leads the list and is able to compete even with the ones that have more comprehensive features. 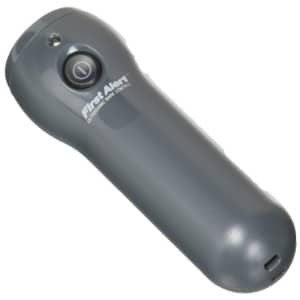 Finally, this First Alert Bark Genie is an even less expensive and more useful handheld anti-bark device that is so cheap that you will be able to purchase multiple units for everyone in the house to carry one in their product handbag, backpack or simply clipped to their belt. The Bark Genie is a terrific handheld device that works about the same as the previous listing but is a little less expensive and takes a different type of battery. There are both advantages and disadvantages to going with this particular handheld bark deterrent then the previous one. But just like the Dog Dazer, this is intended for anyone who wants to communicate loudly and forcefully with dogs. This bark deterrent will work to keep your dog from barking. All you have to do is press the button and your dog will immediately stop. You can even use it on neighboring dogs if you want. But it is also intended for the person that wants to prevent dogs from approaching them, keep strays away from their yard or various other applications. However, this does have a slight limitation in comparison with the previous model – it only works up to 15 feet with the same line of sight restriction that the other bark deterrent works on. You have to use this with four AAA batteries, and it still uses the perfectly safe and humane ultrasonic sound waves that the others listed here use. It is very effective, but you have to actually go out in the yard and approach your dog in order to use it. The range limitation is a big issue here, but the price is absolutely incredible. For about the same amount that you would spend on your lunch, you can get this bark deterrent to keep your dog from barking in the yard, or to protect yourself against dogs when you’re out walking around the neighborhood. There are a lot of different factors to weigh when it comes to choosing the right dog silencer. We will be looking at all of the factors here. There is plenty that you need to know before it comes to the actual chore of choosing the right bark deterrent, with a couple of dozen different things to consider. You have to be aware of things like the types of dog silencers that are out there and exactly how they work, the range of your dog silencer and whether will be enough to be effective against your dog, whether your dog silencer requires an action from you or whether it is automatic, the battery that your dog silencer uses and more. You also have to understand additional features that are available, and what you should be using dog silencers for in the first place. The purpose of this buying guide is to give you all the information that you need in order to make an informed decision about which dog silencer to choose. There are so many different types out there and so many different options that it can be extremely difficult to get the right one. This is especially true for anyone who has not yet done any sort of research or shopping for a dog silencer. But that’s exactly what this article intends to provide for you. Let’s start with some basic information on how to choose the right dog silencer. So, how do you choose a dog silencer? The first thing you want to do is determine where your need comes from. You may be a dog owner who is annoyed by your dog’s incessant barking, as well as being annoyed by your neighbor’s constants requests for your dog to be disciplined, or you may simply be the neighbor in question, where the dog in question barks all night long without stopping. Dogs have an innate urge to bark, so you cannot really blame the dog. However, getting a dog silencer and installing it may be the perfect solution to your problem. But dog silencers are not just used to prevent dogs from barking. The way the dog silencers work is by emitting a loud sound that only dogs can hear or feel. In some cases, you can get a dog silencer that is actually going to work on a dog that is not your own. For example, you might be able to get a dog silencer the works on your neighbor’s dog. But you also may be able to prevent other types of dog behavior as well as other stray pets. Many postal carriers, salespeople, delivery people and others who encounter dogs on a regular basis might carry a dog silencer in order to prevent an attack or to keep them from barking while they are doing their route. There are lots of different devices on the market these days. Some of them are completely humane and utilize the latest technology, while others still use shock therapy in order to get dogs to stop barking. Whichever one you choose will be up to you, but most dog experts will tell you that shock therapy is a very ineffective way to communicate negative behavior reaction with your dog. There are other ways that you can tell your dog that they are doing something that you do not want them to do. For example, many dog owners simply use the word ‘no’. However, if the word no does not work on your dog, then you may have to resort to other measures. Some of the various methods that are used include committing an ultrasonic sound that only your dog can hear which stops them barking immediately. This is the most humane way to correct your dog’s behavior, and it is the latest way that anti-barking devices or design. There are also citronella devices which blasts your dog with a citronella essence when your dog barks, often interrupting the bark and getting them to stop. Then there are shock devices which deliver an electrical charge to your shock – very low level so does not actually hurt them – to tell them that their behavior is not appropriate. The exact type of bark deterrent that you use is up to you. There are plenty of dog silencers on the market, but there are basically five different types of silencers. Understanding what each of these different types is and how they work is important when it comes to making a decision on which one to get. Let’s look at each of these silencers one by one. The first type of dog silencer is the most highly recommended one by dog experts and veterinarians. It is the ultrasonic silencer type. You have probably heard of dog whistles that only dogs can hear, and the ultrasonic device works in very much the same way. They met a loud tone that only your dog can hear which prevents them from continuing whatever behavior they are currently exhibiting. If they are barking, then pressing a button or an automatic ultrasonic pulse will keep them from continuing that behavior. The second type of antibiotic device that we are going to discuss is the handheld device. Although handheld devices may work on the same electronic principal as other types of devices, the difference is that you have to actually press the button and point them at your target before they can be used. They also often have limited range. But the benefit of these types of devices is that they are usually very inexpensive. Another type of dog silencer is the dog collar. These types of dog collars may use ultrasonic devices, shock devices or some other method in order to deliver a warning to your dog to stop their current behavior. The type of warning that the deliver will depend upon the particular device and you will have to make a decision on what works best for your dog. Citronella devices were a common alternative to dog shock collars on the market a few years ago, but they have also been pretty much eliminated due to the ultrasonic technology that is currently available. However, there are many owners that still believe in the power of the citronella device. They work by spraying citronella when the dog barks and are often attached to a dog collar. Finally, there are shock devices which are commonly referred to as shock collars. These delivered electrical charge to your dog whenever he or she barks. They are particularly effective, because they are attached to the collar in which the dog wears. However, many health experts do not feel as if this is the most humane way to correct your dog’s behavior. One of the first things that you will notice is that dog silencer devices have a certain range. Whether you are using a handheld dog silencer or you are mounting one on the side of your house or to the middle of a tree in your yard, the range is still going to be somewhat limited. Even the low-end models that cost the least are going to have a least a 15 foot range, while the higher-end models that have a lot of features and customization are going to extend to 50, 60 or even 70 feet from the central location. The range that you need will depend upon how big your yard is, the size of your dog, what you are planning on using the dog silencer for and various other factors. Another feature that you want to look for is whether or not your dog silencer has an indicator that will tell you when the battery is low. Having a low battery is an important factor when it comes to these types of silencers, because you need to know when your battery is low. These types of devices take all kinds of batteries including replaceable and rechargeable, but the most important thing is to make sure that the batteries have as much charge as possible when they are in use. If you have a weak battery, then these devices are not going to be effective at all, and they are not going to have the deterrent effect that you hope to have on your dog. You may also like some of the additional features that these devices offer. For example, there is a reason that citronella is used in order to correct your dog’s behavior instead of some other substance. Citronella devices can actually have a major impact on the insects that surround your dog and prevent them from being bitten because they are able to create a barrier between the insects that bite your dog, like mosquitoes and fleas, and the air around your dog. This is one of the reasons why citronella devices became so popular among dog owners. However, there are other additional features that you want to consider as well. For example, instead of functioning is just the dog silencer, you can have a citronella repellent device work as a pest repellent for your dog. It will effectively remove pests from your home as well as from around your dog, ridding your house of rodents and insects, as well as skunks and raccoons. Plus, many of these devices have a sensor mode which will detect when a potential pest is in your yard or in your home and they will activate at that point as well. Of course, this makes it more difficult to train your dog properly, but it is an effective pest repellent. Knowing what the top brands are out there will help you make the best decision on some of the top brands out there. Knowing what those brands are is the first step. Aspectek is probably the top brand in the business, located in Vancouver, British Columbia, and well known for making all sorts of dog products including anti-bark devices. There is also another brand called Dogtek that is responsible for making all sorts of pet accessories and fencing systems that utilize the latest electronics in order to correct dog’s behavior. Finally, Dazer is an important brand when it comes to getting the right nutrition for your dog as well as correcting their behavior. This is one of the best brands out there that makes products that are intended to do exactly that. There are definitely numerous benefits to having a dog silencer. Obviously, the most important benefit is that you are able to keep your dog from barking and making noise in the middle the night. This will not only allow you and your neighbor sleep in peace, but it will also allow you to settle down and get a full night’s rest as well. Getting a good night’s rest is important for everyone, and your dog barking in the middle of the night going to create a problem for you as well as for the people around you. Unfortunately, barking is one of the only ways that your dog can communicate. You also be developing a better relationship with your dog by showing him or her that it is not appropriate to bark incessantly. It is never quite clear what your dog is barking about, but since dogs often bark at other dogs and animals, it is safe to assume that there is something triggering the barking. In some cases, your dog barking can be a huge advantage, especially if he or she is trying to alert you to someone on your property, but by limiting barking to those situations, you are able to bond more with your dog and will not get angry as often which makes for a much healthier relationship. The remote control is an additional accessory that some systems come with that allows you to activate the silencer remotely. In the case of handheld silencers like a couple of the ones that we reviewed above, the remote control is actually the device itself. In other cases, the remote control is separate with the actual sound or correction method coming from the dog’s collar or the mounted device. There are a number of advantages to having a remote control. You are able to turn off the device from going off automatically whenever your dog barks and use the correction more sparingly which can make it much more effective. If your dog gets used to the correction, then it is going to be ineffective because he or she will just shrug it off. But if you use a remote when you are home, then you can use it when the barking actually becomes a problem. In addition, you are able to reinforce the correction from the anti-barking device with a command or look that tells your dog that you want them to stop barking. This makes the noise from the device, the vibration or citronella spray even more effective because your dog now knows that it means that you do not want them to continue that behavior. Let’s take a look at three important tips that you should follow when it comes to choosing the right dog silencer. These are just a few extra things that you should pay attention to, although if you have already found the perfect dog silencer, then you don’t necessarily have to worry about them. But you want to get the best possible silencer for your dog that you can and these tips can help. Do Your Research: First, make sure that you do your research. Look at all of the manufacturer specifications, the kind of warranty that comes with the device and what other customers have said about the anti-barking device as well. You want to have a really good idea what to expect when you start using it. You may learn by doing research that this type of silencer does not work very well with your particular breed of dog or something else crucial to your buying decision. Avoid Buying in the Pet Store: You should also avoid buying silencers in the pet stores. For one thing, your options are pretty limited as to what to get, and they are going to be more expensive than you can find online. To check the quality and do actual research on the product, plus save money on it, you’re going to want to shop online for the anti-barking device that you get. Be Cautious of Recommendations: You may also want to be cautious of websites that only offer a single option. If you are doing your search and you come across to review where you only have a single option recommended to you, then you probably want to avoid that device. That’s because dogs are unique and every anti-barking device is a little bit different. There is no one dog silencer on the market that is going to work for every dog out there. A dog silencer does have some limitations that you should be aware of. First of all, you may be under the impression that if your dog is deaf an audible silencer will not work. That is not necessarily true. Some dogs that are deaf are still able to make use of these types of silencers. However, you should also be aware that audible silencers may not work on very young dogs or very old dogs either. In fact, with very young dogs, you want to avoid using silencers because there hearing is still developing you can damage it. Another thing you want to be aware of is that this isn’t going to solve the problem of your dog barking. It may offer some relief and get him to cut down on the barking, but your dog is barking for a reason and you have to address the underlying concern before you can solve the problem completely. If your dog is barking because he or she is hungry, want to come inside, cold or has another problem, or if your dog is barking simply because of anxiety or fear, then you’re going to have to address these concerns before you can solve the problem completely. Something else to be aware of is that silencers are line of sight devices. If you put your silencer on the side of your house and your dog is around the corner, then the silencer is not going to work. Of course, if you have a dog collar silencer or a different type, then this isn’t a huge concern. This is especially true though with the handheld units. You have to be able to get within range of your dog and have no obstacles between you and him. So, how much does a dog silencer cost, or how much should it cost? You can find dog silencers on the market for about what you might spend on lunch at the deli. However, these are usually handheld devices that are very simple without any additional features. The amount that you should spend it is dependent upon what kind of features you want. For a fully featured dog silencer that uses ultrasonic waves and has an extremely long range, you might expect to spend a couple hundred dollars on a good one. So you will have to figure out where you want to be in between that high price and the starting price. The main thing that you want to do is determine what your absolute maximum budget is and then sit down and come up with all the features that you have to have, even measuring to find out what kind of range you need to get and then do your research on your dog silencer based upon that. If you can figure out what need before you start shopping, then you are able to get everything that you need and not pay too much for it. However, your price should be somewhat flexible because if you find one that has everything but is a few dollars more, than it is worth getting it. The bottom line is that there are plenty of things to keep in mind when it comes to shopping for a dog silencer. You have to determine what sort of correction methods you are comfortable with, what type of silencer you want to use and what range you need. You also want to determine what sort of features you want with your device, like a remote control, and then evaluate the results based upon brand name, price and dozens of other factors. This buying guide should give you some insight on how to do that and ensure that you choose the best dog silencer for the money. There is a lot to know about choosing a dog silencer, but you should be much better prepared now.